Large-scale scientific studies are geared towards evaluating complex questions about health and human behavior. Using surveys, the lifestyles of thousands of people are tracked for decades. Then researchers use statistical methods to associate behaviors (e.g., smoking) with health outcomes (e.g., cancer risk). A common side effect of this analysis is to either reinforce or challenge conventional practices (e.g., taking a daily vitamin). Occasionally, the findings are weighty enough to provoke national media scrutiny or behavioral and policy changes. Media outlets like USA Today, Reuters, the Associated Press, and CNN responded with splashy headlines like “Vitamins linked to higher risk of death.” These headlines have the power to simultaneously attract and scare readers. But is it really true? Does this recent study slam the door on decades of conventional wisdom? To help shed light on the results of this controversial study, I enlisted the help of Dr. Paul Jacques, Director of the Nutritional Epidemiology Laboratory at Tufts. Does taking a vitamin/mineral supplement affect people’s risk of death? 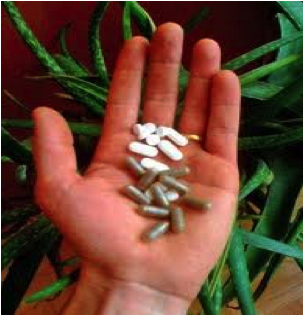 Most people assume common daily supplements improve health outcomes, or at least do no harm. However, data from the Iowa Women’s Health Initiative suggest the opposite is true. The article used surveys to track about 40,000 older women from 1986 to 2004. Supplement use was correlated with mortality rate. The higher the correlation, the stronger the relationship is between the two factors. For example: driving fast on the highway increases your chances of getting a traffic citation. Statisticians used the data to construct hazard ratios which assign “normal” behavior a risk of 1.0. Normal behavior was no supplement use at any of the three surveyed time points. People who used supplements had their mortality risk evaluated relative to the 1.0 reference. Risks above 1.0 (e.g., 1.1) indicate that group of people carried a greater risk of death. Likewise, risk values below 1.0 pertain to a reduced mortality rate. Several surprising results were reported. Multivitamin users had a risk ratio of 1.06, meaning they had a higher mortality rate than those who did not take a multivitamin. Other supplements were more strongly associated: vitamin B6 = 1.10, folate (B9) = 1.15, iron = 1.10, and copper = 1.45. A couple supplements seemed to confer benefits to users: calcium = 0.91, and vitamin B complex = 0.91. If you’ve been reading carefully the results are curious. Two B vitamins taken alone associated with greater risk while a B complex supplement appeared beneficial. Moreover, multivitamins have B-complexes as part of the formula. The authors conclude the following: “Based on existing evidence, we see little justification for the general and widespread use of dietary supplements…our study raises a concern regarding their long-term safety.” These statements seem damaging to the billion-dollar supplement industry and the media was quick to report on the potential pitfalls. However, inconsistencies exist. Understanding the methodology and statistical analyses becomes paramount to digesting the implications of this study. Statistics don’t lie; they are simply calculations. However, the methods of data collection and controls significantly affect the outcome. The study has significant flaws in these regards. Supplement use was evaluated by survey at only three time points in 18 years. While surveys can have significant inaccuracies, Dr. Jacques notes that errors can offset one another. Researchers hope equal numbers of people under- and over-report supplement use. The fact remains that supplement use was evaluated infrequently and changes in usage could be entirely missed. Is it likely for people take the same supplement combinations for 18 years? Supplements are rarely used in isolation. For example, only 229 people (0.59%) reported using copper alone as a supplement. The high relative risk for this subset (1.45) could be due to the supplement, a small sample size, or confounding factors. A person that would supplement with only copper probably has other unusual behaviors or filled out the surveys incorrectly. In other words, it may not be the copper that’s the problem. The issue of confounding has long plagued large-scale studies like this one. How can you account for the fact that vitamin users tend to be more educated and wealthy? According to Dr. Jacques, statisticians accurately account for these factors if they are measured well. Smoking, which is easily measured with accuracy, can be reliably controlled in statistical analyses. Physical activity, which is difficult to measure, is not easily removed from the calculation. Confounders can be neutralized somewhat by having a very large sample size. This practice is common to epidemiology but is not without its shortcomings. Let’s assume confounders were handled correctly. There remain several unnerving aspects as to how the study was conducted. No blood tests were administered. Thus, it’s impossible to tell if anyone who reported taking a supplement actually derived any physiological change from it. It’s spurious to associate supplements with mortality if there is no data to corroborate the survey tool. Over 15,000 (40%) of the women in the study had died by 2008. That means many were sick while being surveyed. It’s a well-known phenomenon that people begin supplement use upon diagnosis of a disease. For example, diagnosis of heart disease can prompt a change in diet and initiate the use of aspirin, vitamins, and fish oils. Those supplements are widely regarded as preventive tools, not treatments. The people who died from heart disease probably did not die because of the supplements or diet. They began the practices after it was “too late.” However, the methodology wouldn’t account for that and the death would be tied to supplement use. Weeding through the data of a massive health survey is complicated. National media reports on vitamins are likely premature and this study had significant flaws. However, studies like this provide a platform for connecting the dots between test tubes, animal models, small human randomized-controlled trials, and large uncontrolled trials. The hope is that a pattern can be gleaned from all levels of research. Such patterns can be turned into successful public health campaigns. For example, folate fortification successfully reduced the incidence of birth defects. This study underscores growing concerns over iron and copper supplementation. Take large survey results with a grain of salt. Many of the aforementioned study designs show vitamins to be beneficial, which calls the survey results into question. Vitamin supplementation is but one health concern. Smoking and exercise behaviors are better-established factors in longevity. If a national health headline worries you, carefully read the study it’s based on before allowing it to change your life. It pays to read the fine print. Understanding the original publication can be difficult. Don’t be afraid to get a bit of help in translation. Max Prokopy is a first-year Biochemical and Molecular Nutrition PhD student who has certifications and experience with training prep, collegiate and professional athletes with a particular focus on ice hockey.